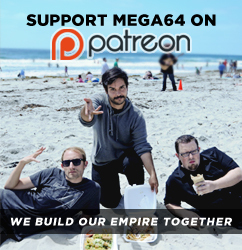 MEGA64 PODCAST 116 EMERGES FROM THE LAND OF THE RISING SUN!! This week's Mega64 Podcast is Rocco's roadside account of his week at Tokyo Game Show. He's got footage from TGS, as well as his take on what's happening in this darn industry right now! He also reviews the PSP Go. So, there's that. Audio version is here. We're sorry there wasn't a live show on Sunday- A filming opportunity came up that we just couldn't miss. We will attempt to make it up to you with a new video... Come back tomorrow!